Do you remember the post I wrote a couple of weeks ago about how to interact at conferences? Well, I was recently approached by fellow EFL teacher, Cara Leopold asking if she could write a guest post on the topic of conferences. Her specialist area is listening training. She helps learners like you become better listeners of informal spoken English no matter what accent. I jumped at the idea. In this post, Cara shows you how important it is to listen, not just during the programmed talks BUT outside during the all-important networking sessions that are essential at conferences. Are you off to any conferences soon? Conference season is in full swing. Shanthi was at one two weeks ago. I’m going to TESOL France this Sunday (my first time at an English Language Teaching conference). You’ve probably got conferences coming up in your industry as the year comes to an end. Conferences are not just an opportunity to keep up with industry trends and learn from peers. Talking to people in person. Finding out about new opportunities. But understanding and navigating these moments requires a particular set of listening skills. Do you know why I specialise in teaching listening online? I have a client who struggled to understand native speakers of English at conferences. Not during the talks and workshops. But afterwards, during informal chats at breaks or in the evening. She struggled to follow conversations and would translate into her native language (French) as a way to comprehend. The result? She lost her place in the conversation. She gives conference talks about 3 times a year. That’s a lot of potential missed opportunities. So why is conversational listening so difficult compared to listening to a conference talk? And how can you understand other speakers, especially natives, during those crucial networking moments? They’re long, so you have to concentrate for some time, in English. Certain ideas or concepts might be new, so you’ll need time to process them. New ideas means new vocabulary and expressions. You have to concentrate and listen carefully to take notes or prepare any questions you might want to ask. Complex relations between ideas mean it can be hard to make sense of it all. The speaker is educating you or persuading you about their point of view. So they speak more slowly and carefully. They use pauses for effect, which gives you time to gather your thoughts. You know what the talk is going to be about. So your brain starts anticipating words and expressions you might hear, even before the talk begins. The speaker repeats and reformulates the important points so you can catch them. Slideshows and other visual material help you follow the main points. You might have a handout or other written information about the speaker or their talk. You don’t have to prepare your reply while they’re talking. You just listen. Signpost language such as “for example” or “to sum up” helps you follow the talk. If the talk is recorded, you can go back and listen again, perhaps even with subtitles, to clarify any of the finer points. The exchanges are shorter, so you don’t have to concentrate for so long. The ideas aren’t particularly challenging or dense. You don’t know exactly what the topic is or how it might evolve. You don’t have slides or a handout to help you. Your conversation partner or partners may pause, repeat themselves or make false starts. Because conversations aren’t planned in advance. People speak quickly and less carefully because the situation is informal. You conversation partner might use vague language like “stuff” or circumlocutions (using many words to describe something, where one word is enough). You have to quickly understand and then formulate your response. You can’t go back and watch the conversation again to understand – once it’s gone, it’s gone. If you’re in a group situation, you might be able to spend more time just listening. But at some point you’ll be expected to contribute. Or at least show that you’re following. The situation could get embarrassing if you haven’t understood properly. So you’ll have more problems understanding people in informal conversation. You can find out just as much, if not more, during these informal moments compared to the talks. So why miss out? You can start getting ready for chatting at conferences now. And it doesn’t have to be that complicated. Forget extended monologues. TED talks are out. As are documentaries and news reports. Below I share with you my favourite resources. All the YouTube channels mentioned have accurate, closed caption subtitles. Late night entertainment talk shows are great because the interviews are short. And the guests and host talk in a natural and spontaneous way. Some of these can be quite long. Focus on the pleasantries exchanged at the start and then listen to the responses to one or two questions. Some of these are talks, rather than interviews. Make sure that you listen to an interview, like this one. Beware, some episodes are long. Focus on one or two question-response exchanges and listen as many times as you need, rather than trying to understand the whole episode. Informal chat between Jennifer (American) and Dan (British) for the first half of each episode. Weekly chat between Chad, Justin and Ethan. Their conversations sound natural, but they explain any difficult words and expressions to help out English learners. Luke sometimes invites friends, family and other guests on for a chat. They’re not English teachers so the conversation is natural and spontaneous. You can do 2 things to get ready for understanding and responding in conversations. In conversation, you need to understand and process the information, then formulate your response almost immediately. By taking away the pressure of having to respond to a conversation partner, you can focus on listening and catching all the little details. This exercise will accurately evaluate your listening abilities when it comes to real life speech. You’ll find out what you understood or not. It’s much more effective than listening quizzes with comprehension questions, which are open to interpretation or guess work. This time you’re going to pause the video or podcast again, but instead of writing what you’ve just heard, you’re going to predict what the other speaker might say. This works well if the recording is an interview. You can listen to the questions and predict the answers. Write out or read aloud your response, then listen to the next section of the dialogue. How was your prediction? It doesn’t matter if it’s not factually correct. The idea is to respond appropriately to the previous question. You can then use these interaction strategies and patterns in your own conversations. In this extract, I say the sentences from last week’s article in a fast, conversational way. This is how someone might say these examples to you when chatting informally after a talk or workshop. “I think your presentation was great. I loved in particular your points about making an impact on the younger co-workers”. Listen to the right material. Spontaneous, informal, interactive and authentic. Take the stress out of conversational listening and just work on your listening to begin with. Later you can work on formulating responses by pausing and predicting. Listen not only to try to catch everything (dictations), but also to observe how people interact, take turns and interrupt. Chat to as many people as you can at conferences during breaks. I hope your informal networking goes as well as your talk if you’re giving one. Is your listening conversation ready? I created the Leo Listening Level Test to help learners like you find out if their listening is conversation ready. It’s not like the tests you did at school. You write what you hear. You don’t just guess A,B or C like in a traditional test. The sentences are all taken from my spontaneous, conversational speech. I give you my personal feedback and let you know exactly where your weak points are. After you take the test, you get detailed feedback on the difficult points of each question. And tips to help you make further progress in your listening. Plus, my accent training colleague Elena Mutonono is offering an exclusive bonus for people who purchase the test before Friday November 18th at midnight Paris time. 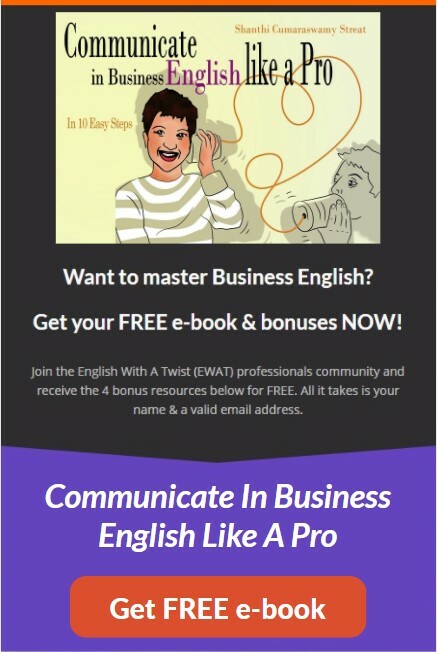 Free access to her LinkedEnglish pronunciation course. Click here to find out more and purchase the test. 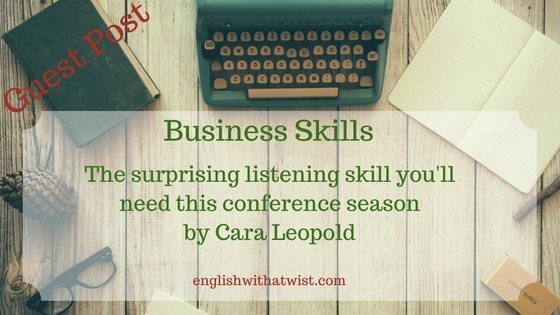 Cara Leopold is the online listening teacher, helping upper-intermediate to advanced learners finally understand spoken English, particularly the informal, conversational kind, no matter the accents involved. Get your copy Cara’s self-study e-guide, Understand Conversational English. Get the guide! Hi Cara and Shanthi, thanks for putting this piece together. There are so many good recommendations for listening material here. Do you know which of these resources also have transcripts available? I always recommend Deep English (deepenglish.com) to my students because the whole text is available along with the audio. Thanks again! I will pass your kind comments on to Cara so she can reply to you. Thanks for the tip about Deep English. Hi Sabrina. Great question! All the YouTube channels I mention have videos with closed captions (human, rather than machine made) so the interactive transcripts underneath are correct. Luke’s English Podcast has a transcript collaboration project so learners can volunteer to transcribe part of an episode. I did one back in June. Luke checks the transcriptions and then they’re published on the site. You can get transcripts of some Real Life English episodes, but not all of them. I’m not sure what Jen and Dan are doing about transcripts, but they do publish downloadable and free episode guides. The 2 non EFL/ESL podcasts don’t come with transcripts as far as I can tell. Lewis Howes’ podcast is on YouTube, but the captions under the video are automatic rather than closed so they might not be 100% accurate. Hope that helps. Thanks for recommending Deep English – didn’t know that one.